[Mick] has been playing around with the VTech Innotab – a $70 tablet computer aimed at kids – for a while now. He’s successfully turned this tablet soon to be found at yard sales the world over into a Linux tablet and can play everything from those magical LucasArts SCUMM adventure games to Angry Birds. What his tablet is missing, though, is any sort of Internet connection. 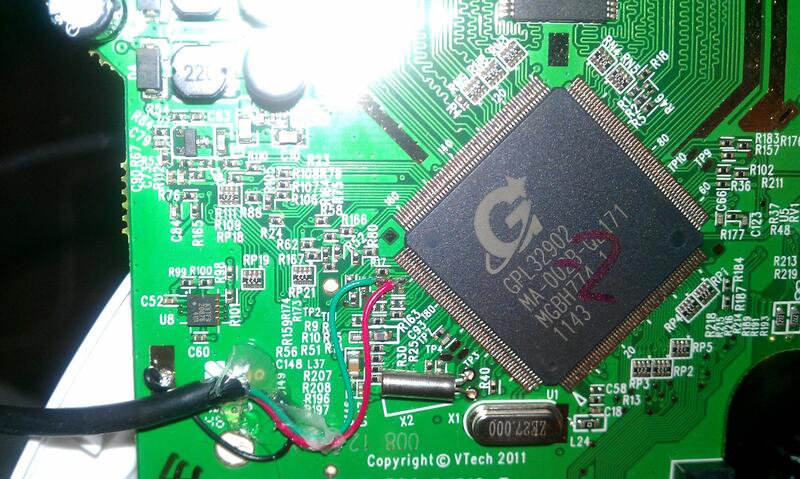 He recently fixed this by soldering a USB WiFi adapter directly to the CPU of his InnoTab. In all fairness, there’s not a terrible amount of software hackery going on here. VTech’s InnoTab 2s uses the same chipset as the cheaper InnoTab 2 but has an additional board soldered directly to the mainboard. This additional board provides a WiFi connection with an RT5370 chipset; soldering a WiFi dongle onto the InnoTab 2’s CPU D+ and D- USB lines effectively turns it into the WiFi enabled InnoTab 2s. It’s an impressive piece of work for a low-power tablet that one can safely assume is both bullet and childproof. [Mick] was also able to mount a USB thumb drive on his upgraded kid’s tablet, so if you’re looking for a cheap tablet that doesn’t need much horsepower, you might want to check out your local Toys ‘R Us. A few weeks ago we caught wind of [Mick] breaking out his screwdrivers and soldering iron to get a serial console on his son’s VTech InnoTab. [Mick] was able to get the touchscreen working and successfully ported SCUMMVM to the device, but there was still a long road ahead to get the source for this pint-sized tablet. [David Anders] from elinux.org wrote in to tell us VTech is now giving away their source for the InnoTab, something they’ve been holding back so far. [Dave] is now verifying the VTech release is 100% complete, so if you’d like to give him a hand, drop him a line. If you’re thinking this is your ticket to an inexpensive and powerful Linux tablet, prepare to be disappointed. The InnoTab is an ARM 11 running at 180 MHz with a paltry 64 MB of RAM. That’s not exactly top-of-the-line hardware, but at the very least you’ll be able to play Doom on it. The Vtech InnoTab is a child-sized tablet computer built for kids. Apart from being the ideal solution to keeping the grubby, sticky hands of nieces and nephews away from proper ‘adult sized’ tablets, it can also serve as a Linux tablet perfect for a few homebrew apps. [Mick] picked up an InnoTab for his son, but after getting BusyBox working, we’re thinking it has become a toy for the father and not the son. [Mick] cracked open the InnoTab and soldered a few wires to a pair of pins that connect to a TTL level converter and then to a TV. There’s a full Linux shell running on [Mick]’s new tablet, encouragement enough for him to start porting ScummVM, the engine behind famous LucasArts point-and-click adventure games of the early 90s. Right now, it’s still very much a work in progress, but [Mick] has full screen support and a virtual keyboard working; more than enough to enjoy Day of the Tentacle and Sam & Max Hit the Road. After the break you can see the video of [Mick]’s InnoTab running the much more child-friendly SCUMM adventure Putt Putt Goes to the Moon, something we’re sure his son will love.